This electric pack draws moisture from the air and retains it in the flannel cover. The standard size covers most backs. A must have for your practice and ideal for use in the home. It has a spring-loaded momentary safety switch, 125V AC 60Hz. The application of moist heat is a commonly prescribed therapy in medical practice today. 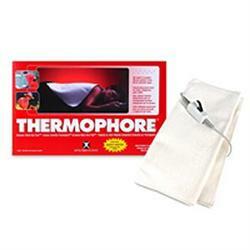 The thermophore hot pack is the method physicians recommend the most. Moist heat increases circulation and speeds recovery by bringing in fresh blood cells and taking away the wastes that hinder healing. The moisture produced by the thermophore hot pack transfers the high heat deeper into tissues than an ordinary dry heat pad. These beneficial results continue for several hours after treatment. Includes removable flannel cover.